Do you require press, PR or corporate photographers for UK coverage? 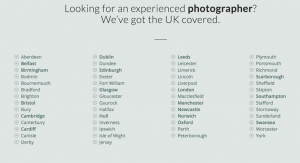 For any nationwide photography bookings please have a look at our map. We are PR, editorial, event and corporate photographers based nationwide, throughout the UK. With over 20 years experience working in the newspaper and publishing industry we are now working on freelance basis with PR agencies, businesses and publications. Our network of photographers is one of the country’s most broadly based; having a team of 53 experienced photographers throughout the UK, Northern Ireland and even contacts in the EU. If your project is just outside the dot where one of our photographers is based, or you are not sure if we cover the area please just drop us a line. We will always try to go the extra mile to get the job done! For a quick quote simply fill out a contact form with as much information as possible and we will get back to you right away.